The day began with a lot of excitement with our student and youth volunteers organizing the awareness bike rally. They were expecting around 200 young people to ride around the suburbs of Mysore city and tell people the differences in the bills. A few of us reached the Baden Powell School, the starting point of the rally at around 9.30 am, while others continued the protest at Gandhi Square. Within an hour, the grounds of the Baden Powell School became a surging mass of young people with their bikes and scooters. Young men and women came in the hundreds and soon we had over a thousand two wheelers assembled. We started off on the rally through the main thoroughfares of the city and travelled through most of the residential and commercial locations. Volunteers who rode pillion stepped off to distribute pamphlets, apply the stickers on vehicles and talk to people about the Bill. The noise of their two wheelers and the blaring of the horns added to the energy and enthusiasm. Despite asking the riders to wear their helmets or not break any traffic rules, most of them were found helmet-less. One could get a taste of the difficulty in managing emotional campaigns, especially involving highly charged up young people. It is indeed a great achievement that all across the nation, the struggle has been nonviolent and peaceful. The rally reached Gandhi Square at around 1.30 pm and I addressed the riders about the bill and the need for the struggle to continue. We spoke about how we need to keep up the momentum and go beyond our demand for a bill and continue our movement to bring in a corruption-free Mysore District. We also had numerous organizations joining us – from the Suvarna Ladies Club, to the Association of Physically Challenged to different student groups and NGOs. Thousands came to express their solidarity with us. While all this is indeed welcome, we need to understand that the struggle is going to be tough and long drawn. The days ahead will not only be determined by how the citizens of Mysore respond to what is happening around the country, but also by the response of Government to Anna Hazare’s demands. We also need to understand that movements like these cannot be sustained by emotions alone. We also need to think strategically and use this enormous positive energy and channelize it into something meaningful and constructive. This would require a different form of leadership and vision. After seeing what young people can do and considering the demographics of India today, the hope lies in what they can and should do. It is only when more of them take on the responsibility of leading this campaign, can we truly hope for change that is sustainable and long-lasting. We closed the day with the meeting of the core group of volunteers. A decision was taken to end the protest at Gandhi Square on Sunday, 21-Aug. 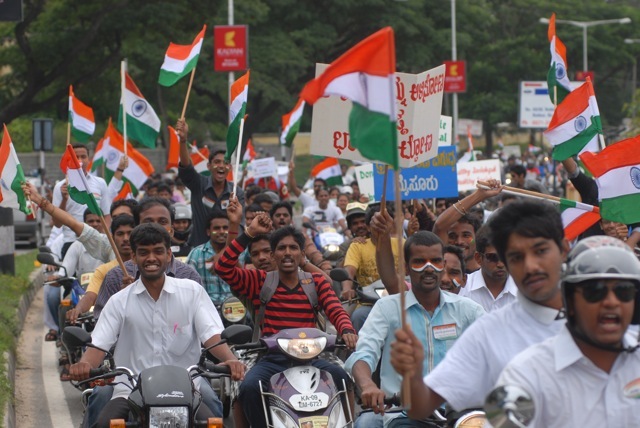 The campaign will be continued by volunteers spreading across the city of Mysore and raising awareness about the differences in the bills – the one presented in Parliament and that demanded by Civil Society. We will also be looking to build a structure for MAC to continue the fight beyond the demand for a strong anti-corruption law in the days to come. People interested in signing up as volunteers are requested to register their names with Ms. Shilpa at 9742020970.